Gobbledygeek episode 147, “Rock ‘Em Sock ‘Em Jaegers (feat. Gregory Sahadachny),” is available for listening or download right here, and on iTunes here. Rising from the sea to do battle with Paul and AJ, the monstrous Greg Sahadachny realizes he can never win and instead decides to discuss Guillermo del Toro’s new film Pacific Rim. 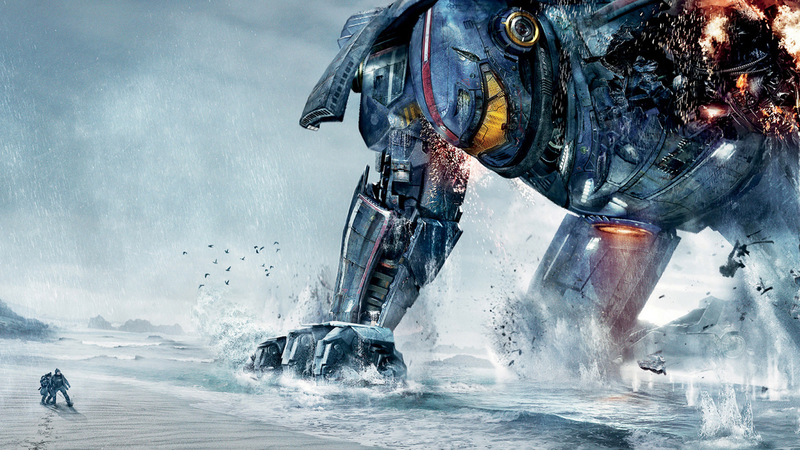 The trio talk about the ins and outs of del Toro’s robots vs. monsters epic, particularly its lack of humanity, emphasis on big action, and exactly how successful that combination is. Plus, How to Train Your Dragon 2 is on its way and Paul somehow liked Spring Breakers. Next: Sir Eric of Sippleonia returns to chat about the 2011 film Detention, which he has been bugging the boys to watch FOREVER. This entry was posted in Uncategorized and tagged film, gobbledygeek, guillermo del toro, how to train your dragon, how to train your dragon 2, kaiju, libsyn, movies, pacific rim, podcast, sci-fi, science fiction, spring breakers. Bookmark the permalink.